EPA estimates not yet available. A timeless idea only holds on to its youthful vigor if it is constantly upgraded. So every new generation of the 911 also represents a new start. For an even better 911. The new generation of engines is more powerful and even more efficient. 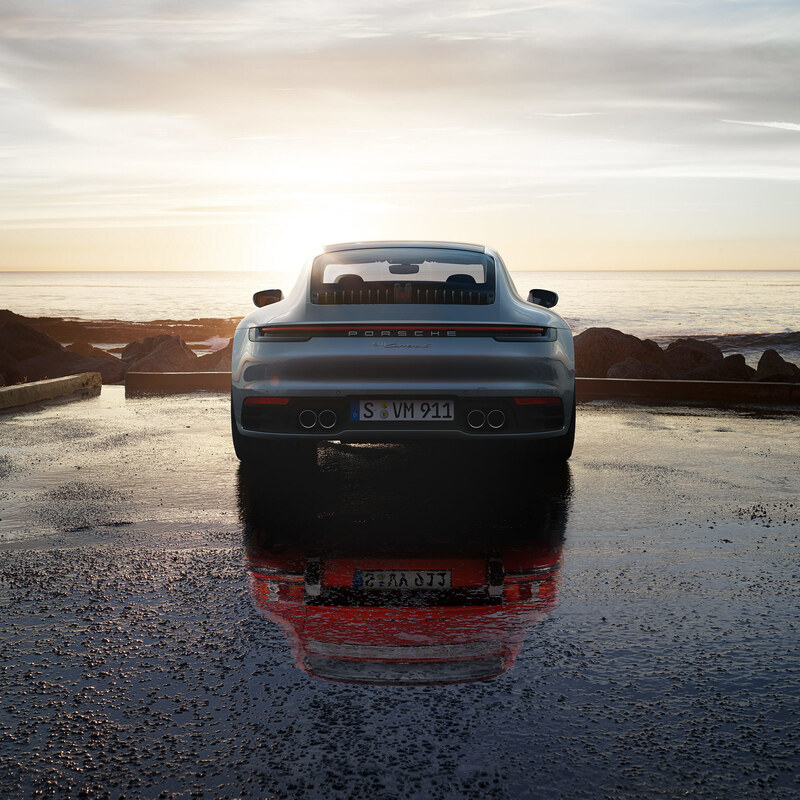 The new 8-speed Porsche Doppelkupplung (PDK) puts forward thrust on the road even more effectively. The newly designed Porsche Active Suspension Management (PASM) increases sporty performance and comfort. Driver assistance systems, such as Lane Keeping Assist including traffic sign recognition and Night Vision Assist, make driving easier. The silhouette of the 911 stands for timeless design. But the new 911 also proves how contemporary it is, especially from behind. The rear end is powerfully, clearly and precisely designed. The rear window appears visually extended and merges, almost seamlessly, into the black tailgate grille. The new, vertical, third brake light is integrated into this. Directly beneath are the seamless light strip, between the three dimensional LED taillights, and the newly designed model logo in Light Silver. The rear fascia surrounds the newly designed tailpipes of the exhaust system. The new 911 also appears particularly athletic due to the differently sized wheels at the front and rear. 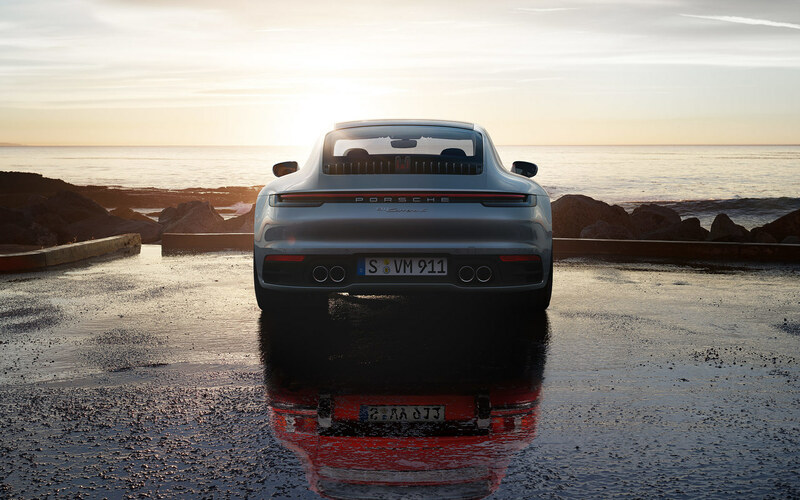 Viewed from the front, the new 911 tells the story of its past. And reveals much about its own future. The fenders are clearly shaped and highlight the powerful geometry and design DNA. 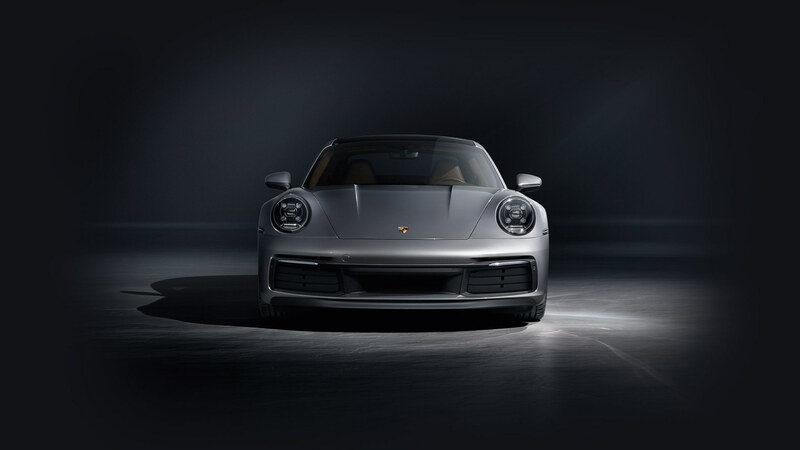 The newly designed front lid with its characteristic dynamic recess profiles – and its straight slope to the front fascia – is a nod to the 911 models of the first generation. Modern LED technology is used in the headlights with four-point daytime running lights and low beam. The camera and sensors in the comfort and assistance systems are integrated under the front fascia. The clarity of the design of the new 911 can be seen in the details. The newly designed exterior mirrors are clear cut, while the retractable door handles are discreetly integrated into the car’s image. Thanks to these details, the overall profile of the new 911 appears more compact, more polished and more technical. The interior clearly emphasizes the horizontal. All relevant operating controls are located, within grasp, to the left and right of the multifunction sport steering wheel. For great operating comfort and therefore full concentration on the road. Directly in view: the instrument cluster with analog tachometer and two high-resolution 7˝ displays. They provide all the essential car information on virtual instruments. Right beside this: the high-resolution 10.9˝ touchscreen display of Porsche Communication Management (PCM) including online navigation. The elevated center console is decoupled from the dashboard and, like the finishes on the dashboard and door panels, underlines the horizontal orientation of the interior. With the Porsche Advanced Cockpit control concept, it now houses only a few, partially touch-sensitive, buttons. Above this are five buttons, which have been consciously kept as analog buttons, for direct access to the essential functions of drive and chassis. From intuitive technology to great comfort. The completely redesigned Sport seats offer secure support even on dynamic cornering maneuvers. The multifunction sport steering wheel allows for comfortable use of audio, telephone and navigation functions. You notice the feel of the operating controls immediately. Every button, every grip, every air outlet has been carefully considered down to the last detail and in high quality. The high-grade feel is highlighted by the finishes in Dark Silver Diamar, or as an option in Light Silver Diamar, brushed aluminum or fine wood. Other leather and finish variations are available upon request. We hear over and over again how the potential of the horizontally opposed engine has been exhausted. Our engineers just smile – and then prove it’s not true. 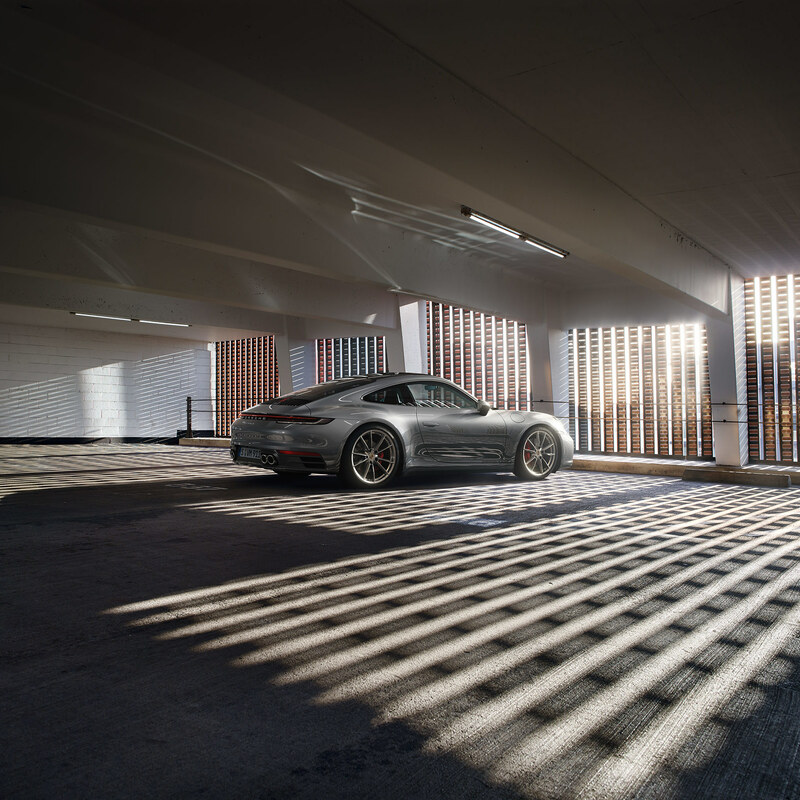 The power output of the horizontally opposed engine has been once again increased in the new 911. The engine mounts have also been positioned closer to the center of the vehicle. This reduces vibrations and increases driving stability. Porsche Traction Management (PTM) is an essential feature of the 911 Carrera 4S. Working in conjunction with Porsche Stability Management (PSM), the all-wheel drive helps ensure the appropriate distribution of force required for excellent driving performance and particularly well-balanced handling when driving at the limit. Depending on the road conditions and the driving mode, the upgraded Porsche Active Suspension Management (PASM) actively and continuously controls the damping force for each individual wheel. Result: reduced body movement and thus more comfort with increased dynamism. The PASM sport suspension, lowered by 10 mm (0.39 inch), is available as an option, making the new 911 even more neutral and balanced when it’s on the road. Porsche Torque Vectoring Plus (PTV Plus) provides exceptional traction and great agility – with precise steering response and balanced load change behavior. And tremendous fun on corners. Upon request, Porsche Dynamic Chassis Control (PDCC) minimizes body roll in the new 911 during dynamic cornering maneuvers, and reduces lateral body movement in the vehicle on rough road surfaces. Acceleration, even when decelerating. It sounds like a paradox, but for 70 years it has been as important a part of our development work as increasing your heart rate when you start your Porsche. This is particularly relevant for the available motorsport-proven Porsche Ceramic Composite Brakes (PCCB). Its ceramic brake discs are particularly light and have a diameter of 410 mm (16.1 inch) at the front and 390 mm (15.3 inch) at the rear - for considerable braking performance. Characteristic: the yellow painted fixed brake calipers on the front and rear axles. Just as characteristic: its extraordinary performance - for when you need to go slow, fast. Moreover, for the first time ever, the new 911 is on the road with differently sized wheels. 20-inch wheels are used at the front and 21-inch at the back in the 911 Carrera S models. While the broader contact surface optimizes driving performance, the larger diameter of the rear wheels increases stability and comfort. The Sport Chrono Package also includes the Porsche Track Precision app for measuring and managing lap times and driving data. To show you precisely what your new personal best time looks like. A rare luxury these days: having the time to concentrate exclusively on what's directly in front of you. The next corner for example. 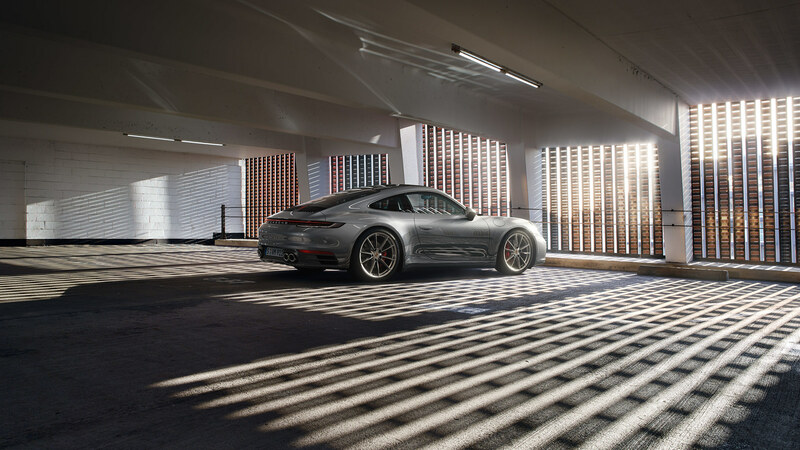 Therefore, the new 911 avails itself of a variety of assistance systems that enable you to remain true to yourself. For example, the collision and brake assist or the new WET mode¹⁾ – a system for recognizing obvious wet road surfaces, that aids drivers when driving in wet conditions. Further assistance systems are available on request, for example adaptive cruise control or ParkAssist with Surround View. For a performance boost in driving experience. The headlights of the new 911 Carrera S models are completely fitted with LED technology. For fast responsiveness and powerful illumination. 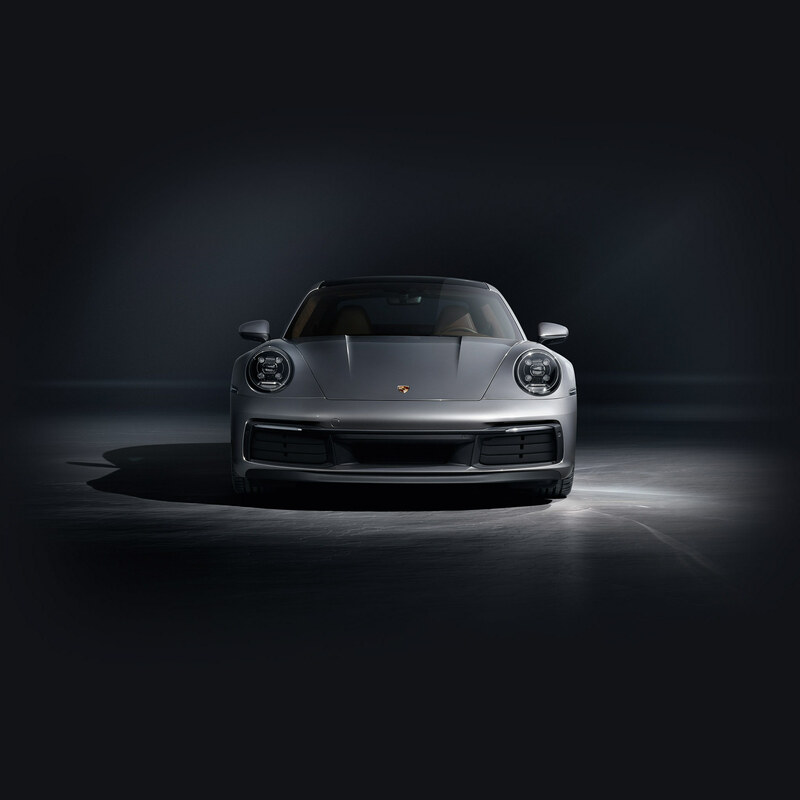 Unmistakably Porsche: the four-point daytime running lights with low beam. Available as an option: LED-Matrix Design headlights including Porsche Dynamic Light System Plus (PDLS Plus) and High Beam Assistant. ¹⁾ The ‘WET’ driving program is not a substitute for adopting appropriate driving in different road and weather conditions, and is, at the most, an aid for the driver. The Sport Seats Plus, available on request, offer even better lateral support for dynamic driving. The two-zone automatic climate control creates a pleasant atmosphere in any driving situation. The new optional ionizer improves the air quality in the interior. Porsche Communication Management (PCM) is your central control center for audio, navigation and communication as well as for a variety of assistance systems. The Burmester® High-End Surround Sound System, available on request, offers sound performance of the highest level, for your own individual 911 soundtrack. 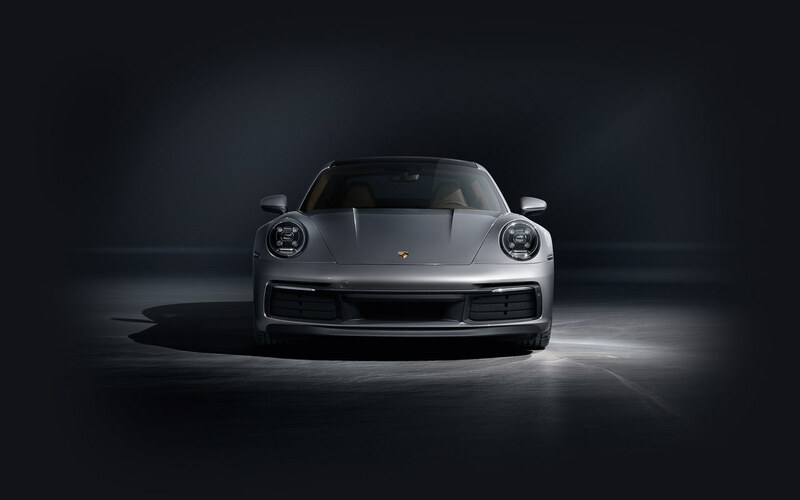 With helpful services and the Porsche Connect App you can synchronize destinations and calendars with your Porsche, plan trips with Real-time Traffic Information and use music services on your smartphone. 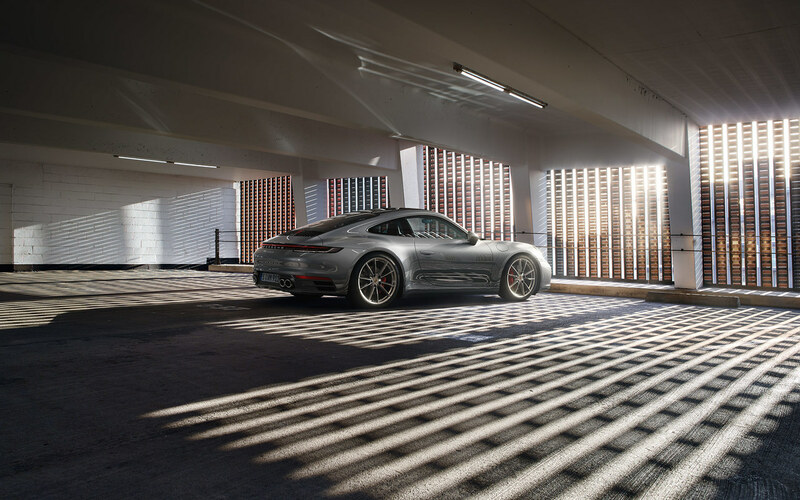 Be navigated, informed and entertained by your Porsche in real time. The navigation and infotainment package helps you to reach your destination faster, thanks to route calculation with up-to-date online maps. Using the voice recognition interface you can easily search for information, such as the weather at your destination, and have current news on the economy, politics and sports read aloud to you.